It is so intriguing how similar ingredients are found in different forms of food all around the world. Today I am going to introduce a very nostalgic pancake that most Korean adults long for when the weather is wet and rainy. The idea of “Let’s have a Buchu Jeon” essentially means “Let’s get inside and have a drink”. 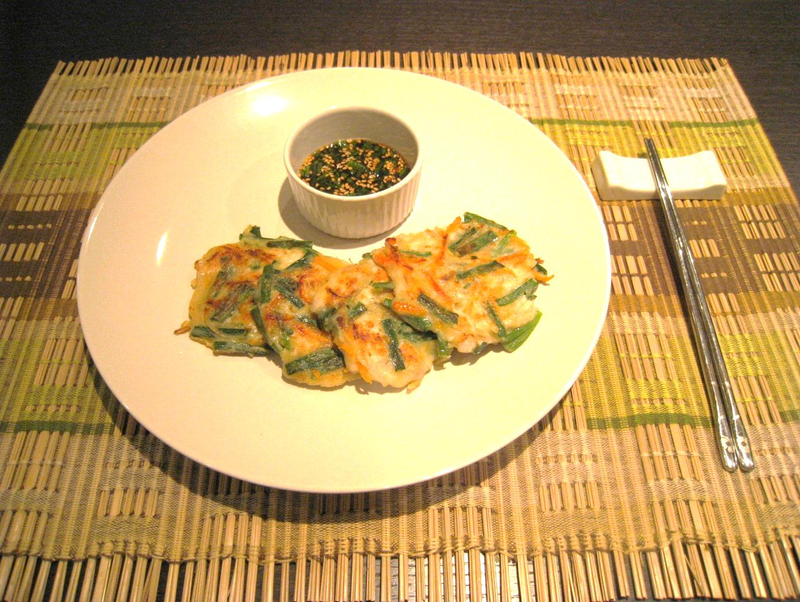 “Buchu Jeon” is a quick snack made from “Buchu” a vegetable always easily found from a street market. The flavour of Buchu resembles leeks or chives. For this reason you can use either of those together as an alternative ingredient for this dish. Buchu is often used to make Korean dumplings (more like a spring roll) in combination with pork, shrimp and tofu. Buchu is full of vitamins especially Vitamin A and C. Buchu cleans your kidneys and liver and is good for those in poor health according to “Dongui Bogam”, a traditional Medical book, compiled by the Royal Physician during the Joseon Dynasty in Korea (1546-1615). We know today that some dark leafy greens such as spinach, broccoli etc. are the best vegetables for our kidneys. Buchu Jeon (Jeon=pancakes) are very good eaten with Korean rice wine known as “Makgeolli” or “Takju” which is drunk at room temperature. My version of Buchu Jeon is more colourful than the tradition and I have added chicken breast to my recipe whereas in Korea normally this is a traditional vegetarian dish but nowadays Koreans often add seafood to the pancake mix. If you do not want to make the batter (flour, corn flour, egg, salt, etc) from scratch then you might be able to buy a pack of Pancake Mix “Bucheam garu” from a Korean supermarket. This is already seasoned and is used by most Koreans, and even restaurants, in their cooking. All you have to do is add vegetables and water to this Pancake Mix. You may serve Buchu Jeon with a soy based dipping sauce but I personally recommend you to eat it without. The best soy sauce would be “Ponzu” (Citron Sauce) which can also be found at a Korean supermarket. A leek has a lot of layers on the inside. If you use leeks for this dish, do not to use the outer few layers of green leaves because they are very tough. To begin with, finely slice the chicken breast into long, thin strips. Prepare all the seasonings (garlic, ginger, white pepper, cooking salt and sugar) on a small plate. 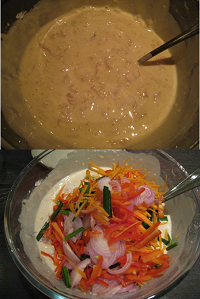 Add ¼ amount of each of the seasonings to the sliced chicken breast, rubbing and mixing them all together. Place aside whilst you prepare the vegetables. Finely slice all the vegetables (Buchu , shallots, carrots and Romano pepper). For the batter, combine the plain flour, rice flour and corn flour and then add an egg and ice cold water whisking thoroughly until you see no lumps. Add the seasoned chicken strips stirring with a whisk until well mixed. Add all the vegetables and the remainder ¾ of the seasonings and mix with a stainless steel spoon one a little bigger than a soup spoon). Preheat a non-stick pan with a tablespoonful of oil on a low heat for a minute. Scoop a spoonful size of the mixture and spread it thinly in the pan and fry on each side until the pancake becomes golden using between a low and medium heat for 5-10 minutes. Do not fry on a high heat rather change the heat from medium to low and back again frequently turning over your “Buchu Jeon” frequently. Tip: if you want to have your Buchu Jeon crisp then make sure enough oil is always in the pan. If you have never had this dish before, you are in for a treat! For the chicken and batter seasonings. ¼ teaspoon, ground black pepper.